• Earl Merkel • • • • • Author, Writer, & Occasional Iconoclast . 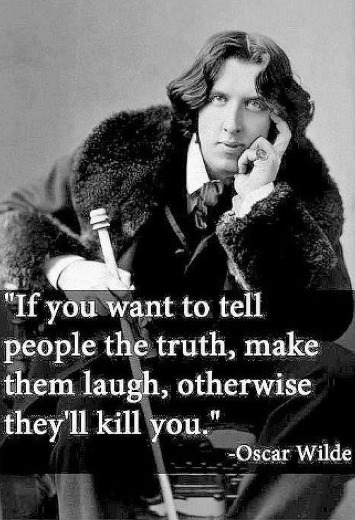 . .
A Note To New Readers. . . 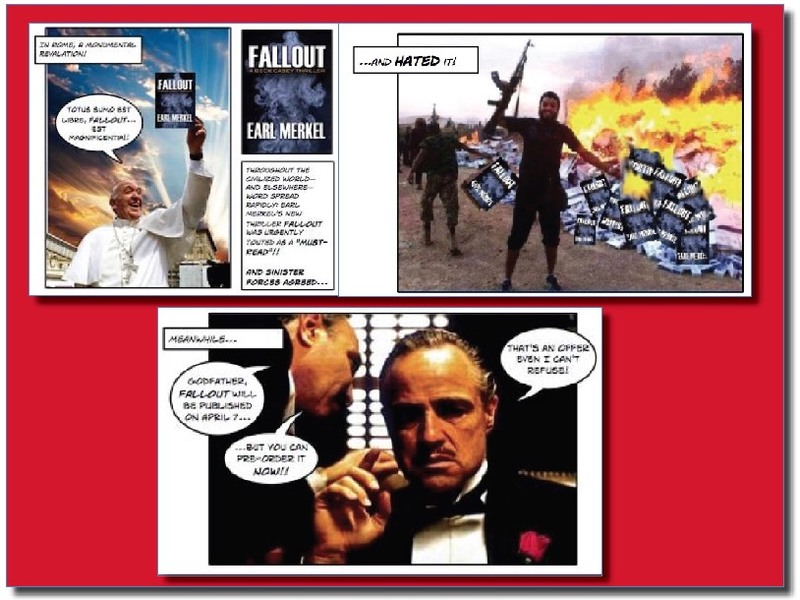 If you've come to this "author's website"—intentionally, or by happy accident, or perhaps under duress from one of my loyal corps of Faithful Readers— you've likely realized (or have been warned) that this website is a relatively accurate reflection of an oft-tormented, oft-bemused, oft-charitably-described-as-"eclectic" writer's psyche. Like most people who write for a living, I'm a meat-hunter— by both nature and circumstance. For that reason alone, <sigh!> expect the not-infrequent plea-'n-pitch for you to "buy my books." In return for your patience, you'll receive what I hope is other content that you'll find entertaining, amusing... or even (occasionally) edifying. Clicking on the links (at left, on the menu; but also throughout the text on these pages, usually in various shades of blue) will take you there. So (buy my books!) 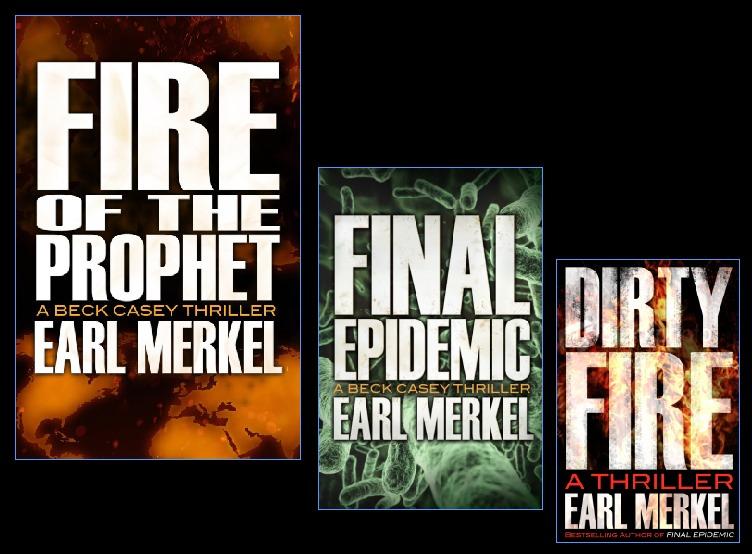 welcome to the Official Earl Merkel Website (buy my books! 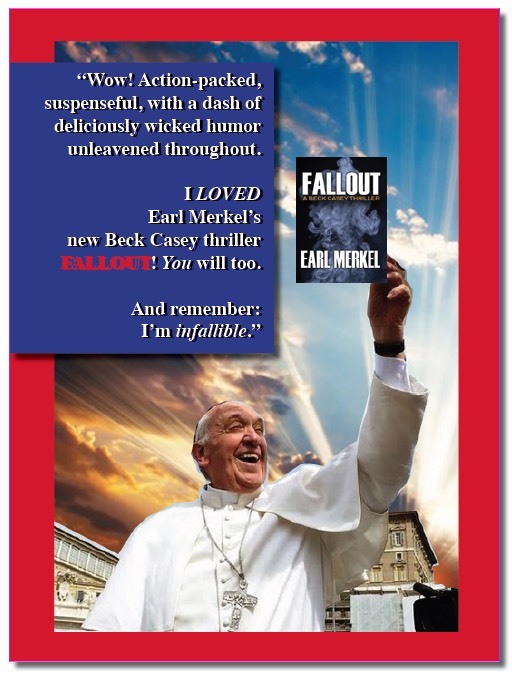 ), where I hope new readers will become Faithful Readers (buy my books!) as we sidle along in our Ongoing Adventure here, together. Amazon Publishes A New Release Of VIRGINS AND MARTYRS! A NewAmazon E-Book Featuring Aria Quynn! VIRGINS AND MARTYRS - A Spanish Bay / Aria Quynn Thriller is available NOW for purchase as an Amazon e-book original! WARNING: Aria Quynn is a very strong woman character; avoid V&M if that description is some sort of a "trigger warning" for you. <chuckle> On the other hand, if you are "triggered" by such things, you're probably not one of my corps of Faithful Readers anyway. It also means you likely should see a competent therapist, because strong women —in life, as well as in fiction— exist to be cherished and admired. And as you may know, Lt. Quynn is a major supporting character in the debut installment of my new Faulk Carpenter Thriller series, itself titled THE LAW OF UNINTENDED CONSEQUENCES, which is also set in the deceptively tranquil sun-and-sugar-sands of Spanish Bay in Northwest Florida. In the new Faulk Carpenter book, she has not attended any anger-management sessions either. To read more about Virgins And Martyrs —and to order the novel— click HERE to visit the Amazon site. NEW Book... And A New Thriller Series! Introducing A New Series, The Faulk Carpenter Thrillers. Available NOW As An Amazon Exclusive E-Book Original! 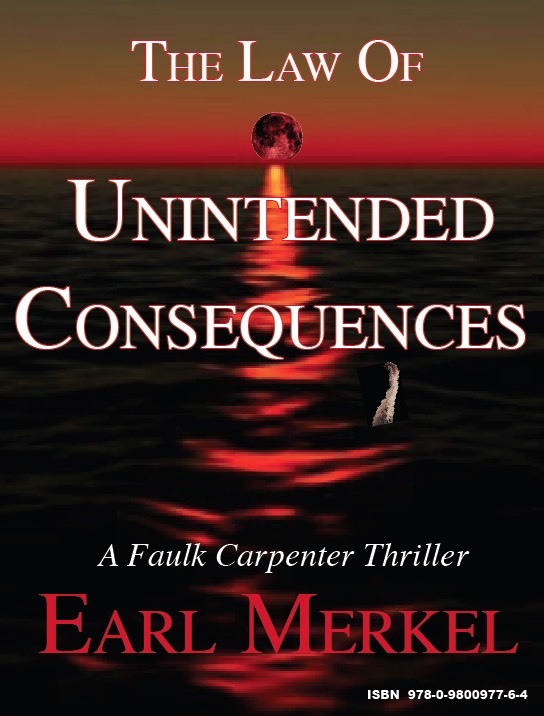 NEWS FLASH: My new mystery-thriller THE LAW OF UNINTENDED CONSEQUENCES (the first in my new Faulk Carpenter thriller series) was published on May 27, 2015 as an Amazon e-book original. ...and I've promised the second Faulk Carpenter book (working-title'd "The Wrong Kind Of Girl") by fall of this year. Whew: it's been a busy spring. 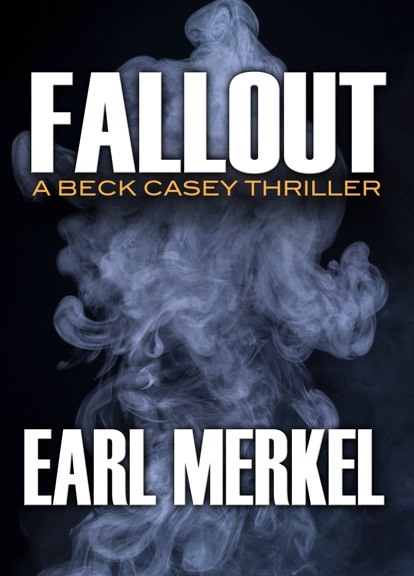 My new thriller FALLOUT (the third installment in the Beck Casey series) was released April 7. 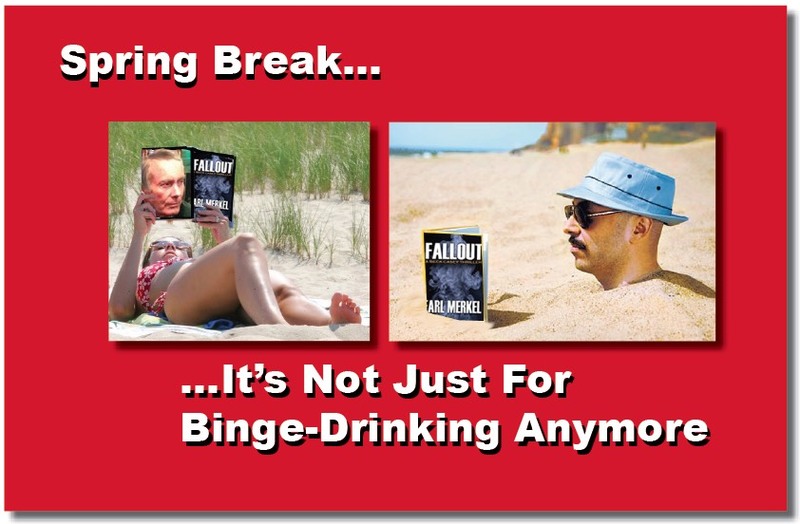 <grin> Suddenly, I'm promoting two new books to the summer beach-reading public. 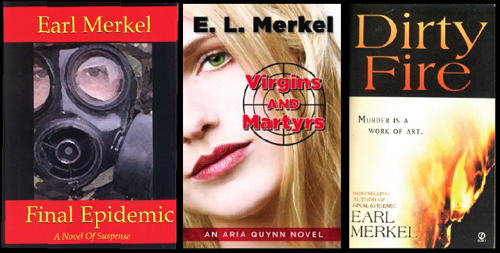 And now the folks at Amazon write to say that they will re-publish my VIRGINS AND MARTYRS (a "starred"/ "highly recommended" Library Journal selection when it was originally published a couple of years ago, featuring several of the characters who return in The Law Of Unintended Consequences) "sometime before the end of June." So let me encourage you to hie yourself with all haste to pick up a copy of THE LAW OF UNINTENDED CONSEQUENCES while Amazon still has it priced at the special introductory $2.99. Click HERE to jump to the novel's page, where you can "Look Inside" for a sample of several chapters. George (below, with his lovely bride) is a very wise man: two copies in the household makes for far less marital discord. "Da. 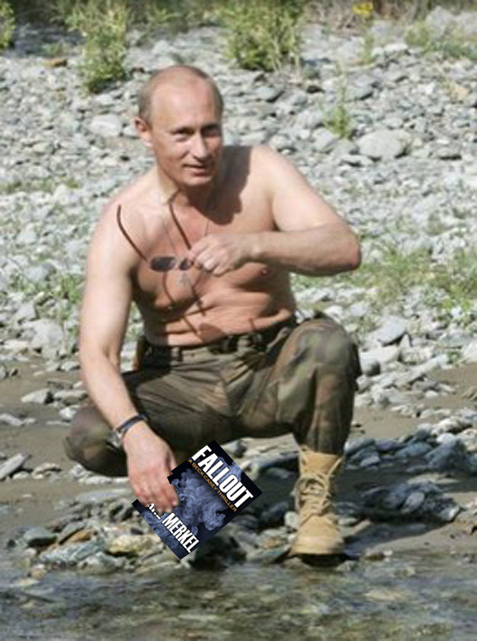 Ve vill buy Russki-language rights... and suppress this book!! Vile ve at it, shoot Moose and Squirrel, too!" So as the Corona beer folks say, "Find Your Beach." FALLOUT Is Released! Available NOW!!! NEW VIDEO: A Video Retrospective Of FALLOUT's Pre-Pub "Marketing." But It IS 1.2 Billion Potential Readers. 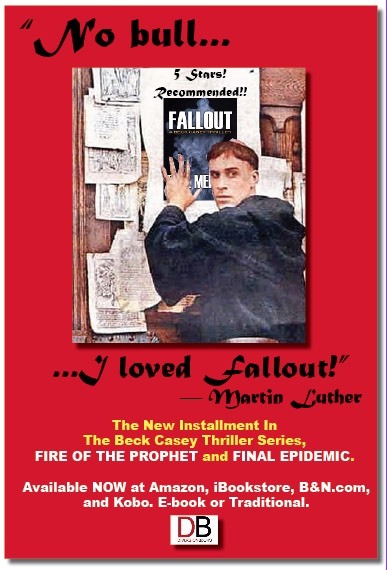 ...and sent me an advance cover of his magazine, eerily dated the same day FALLOUT will be formally released. This enthusiastic blurb was, I assure you, completely unsolicited. But in all humility, wha'cha gonna do? I mean, the guy's a fan. "So... MOO-O-O-OVE Your Tail, Charley!" 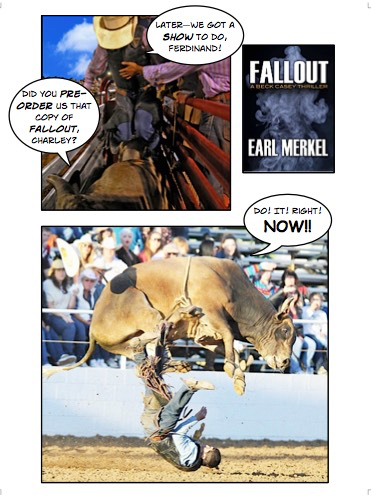 POSTSCRIPT: <sigh> The Publishers ask that I remind everybody that FALLOUT is a thriller, not a bovine-oriented comedy. I've been considering branching out into graphic novels —okay, what we used to call "comic books"— but my total inability to draw even a straight line seems a lethal liability. So my friend and radio-interview guest Neil Gaiman need not fear: his Sandman graphic novels remain without competition from me. 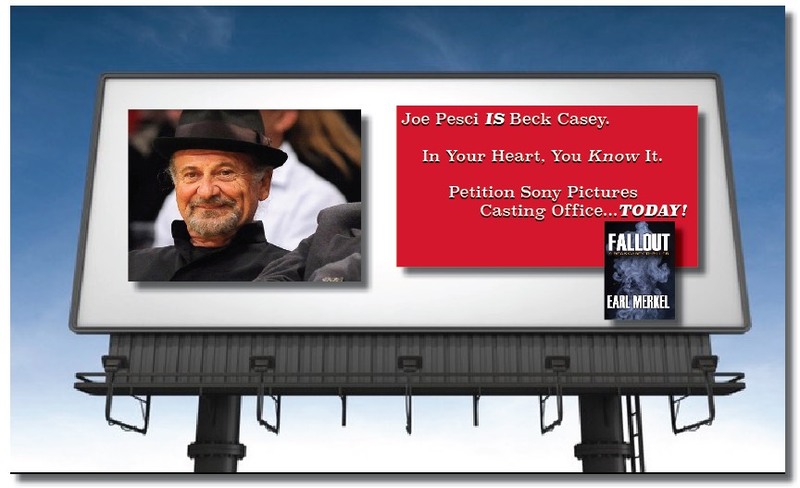 FALLOUT—Y'Know: The New Beck Casey Thriller—Scheduled For Publication On April 7. Win A FREE Advance Copy Of FALLOUT! Okay, so you didn't win last night's Powerball. Your luck is due to change, right? 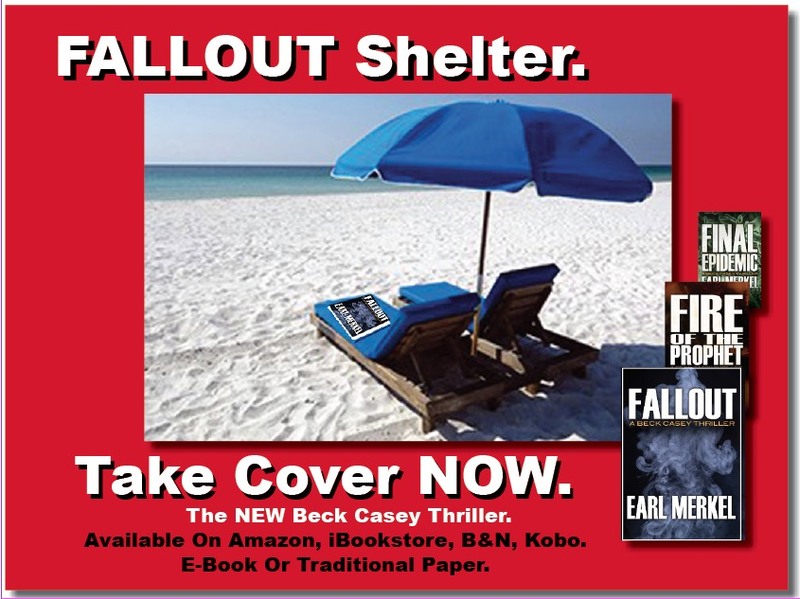 (Click on the link below, then click on "Win A FREE Copy Of FALLOUT." Politically Speaking, Civil Discourse Lives! NOTE: For full impact, view videos as "full screen" with audio on "MAX." 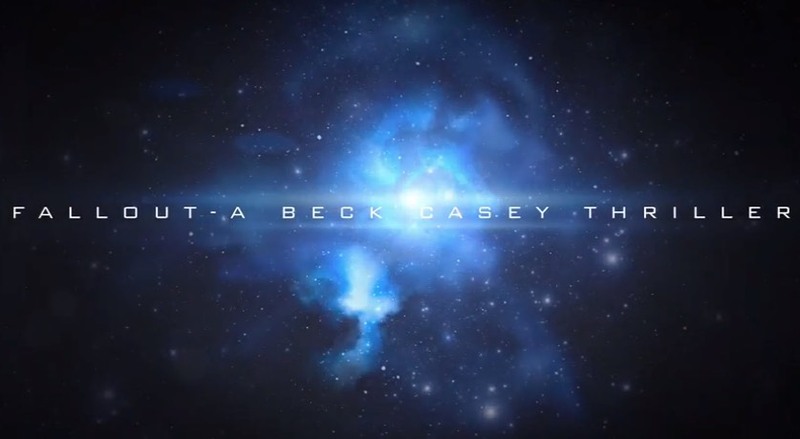 The FINAL EPIDEMIC video book trailer! 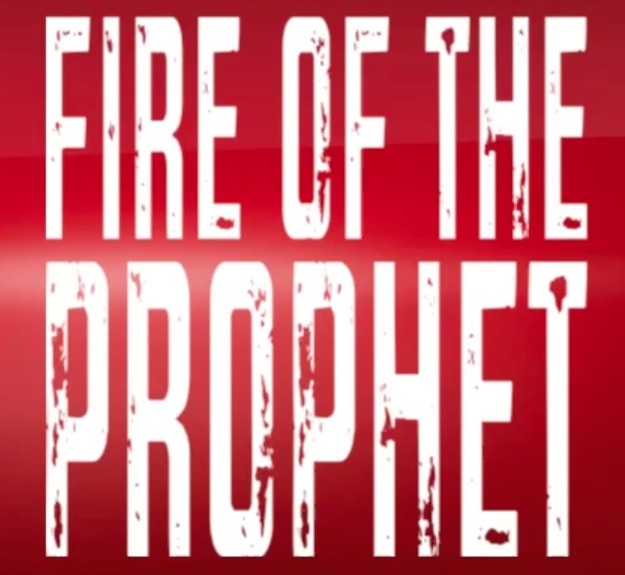 The FIRE OF THE PROPHET video book trailer! 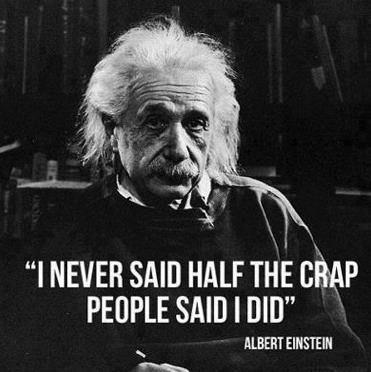 "Yeah: what he said. 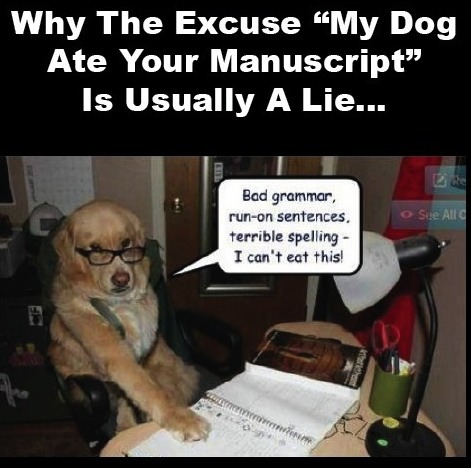 That's my story too, and I'm sticking to it..."
Still, it's better than having your editor say "My DOG wouldn't eat your manuscript!" 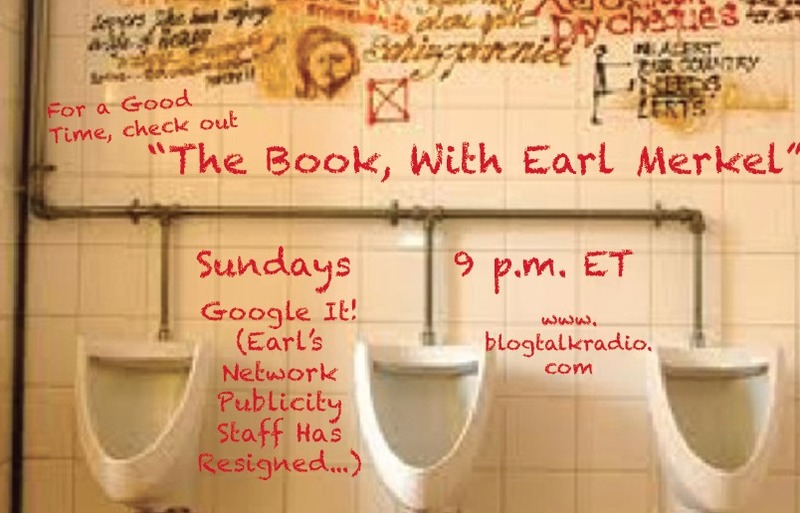 • View the rather humorous video "trailer" for "The Book, With Earl Merkel" radio show! Keep checking this page for updates on both the book's promotions & events. We'll also update Faithful Readers & Listeners on the radio show's hiatus! 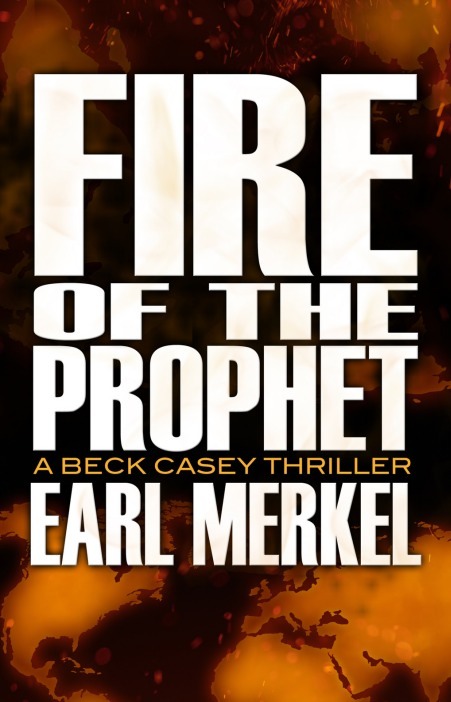 • Radio Interview Of "Earl The Author" On "Book Talk With Ginger Dawn"
• A Sampling Of Book Reviews for FIRE OF THE PROPHET! 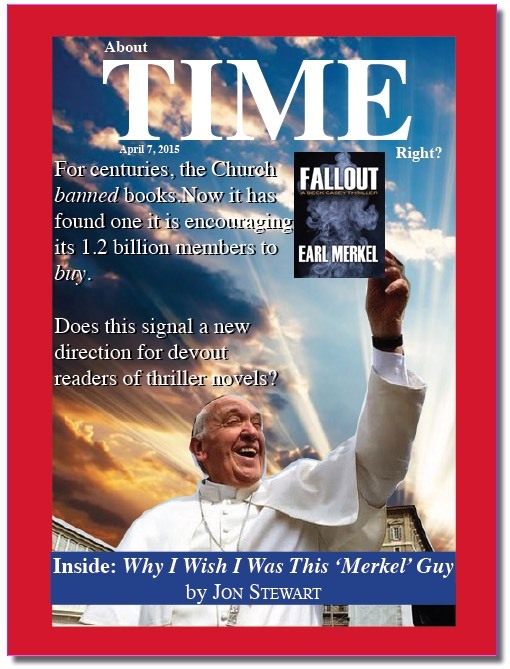 • "Dorothy Parker's Martini Countdown"
From our "Every Dog Has His Day" -archives: Times have changed since the imfamous National Lampoon cover in 1973; today, the extortion notes are being written —and the gun held— by a different paw entirely. It's true: all readers, at least initially, DO judge a book by its cover. I haven't always been thrilled by mine— but oddly, like most authors, I've come to channel my inner Prof. Henry Higgins... humming, when I see them on a bookstore shelf,"I've Grown Accustomed To Her Face." Of course, a truly shameless alumnus might be tempted to emulate that now-aged sexual showman, Hugh Hefner, and channel his own Inner Hedonist. Not I, of course; never. I have to admit, tho-- it would provide a whole new context to the phrase, "ecstacy between the covers..."
And we write Rough Drafts; really, REALLY rough. Mess with us, and you'll get to meet Club Member Alice. 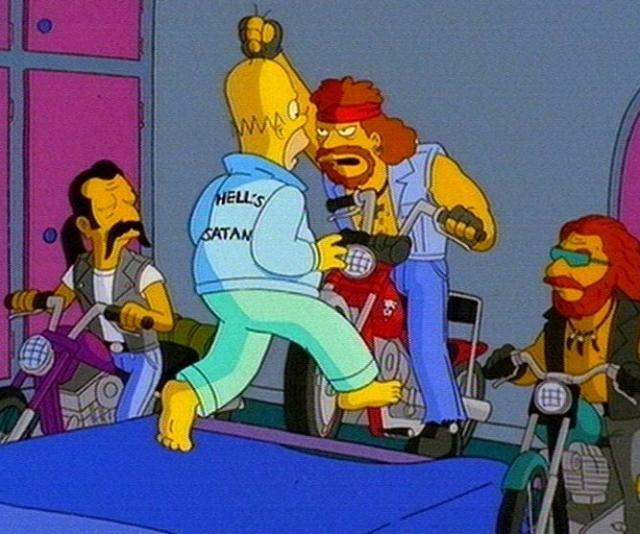 But seriously, folks: I'm considering founding a combined "outlaw motorcycle club & writers' group," and offering franchises in cities around the country. At left (above) are our (proposed) "colors"-- of course, with "YOUR CITY HERE" as the bottom "rocker" ...a temporary expedient, until somebody in your locality antes up the franchise fee. Motorcycle ownership is not mandatory --I think I can borrow a Vespa, but otherwise I'll be the outlaw low-life on the Schwinn-- but all Prospects should probably have written SOMEthing. As an incentive, members will be able to choose their own club-monikers. 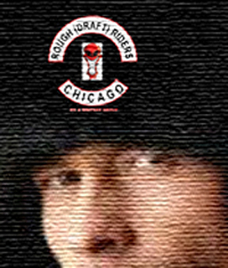 Myself, I haven't decided between "Viper" or "First-Draft." Send your own alias-choice along with your application (and that check, dammit). First five applicants will receive a free "ORIGINAL" -member patch. "Who The Heck Is This Guy??!?"